To provide a safe, quiet, happy, and Christian environment for nursery age children. In order to insure a safe, healthy environment for our children, we must take the responsibility for making sure the children are well before coming to church. Children must be current on their immunizations. We ask that a child be free of fever for 24 hours after a contagious disease before coming back to church. When in doubt, please apply the golden rule. Children who appear ill during a session will be isolated and the parents called. teacher so that she may inform the other parents to take preventive care. child to the nursery, so that we may prepare to adequately meet those needs. Any serious allergies, problems, complaints peculiarities of feeding, etc. should be reported to the Nursery Coordinator, Linda Williams (903) 564-5812 or 813-2251. Open at least 15 minutes before each scheduled event unless other arrangements have been made. See that children are attended at all times. Notify parents promptly in case of any injury or illness. Change diapers as often as necessary. Wash our hands upon entering the nursery area, following each diaper change or toilet assistance and before serving food or drink. Spray the toilet seat with Lysol cleaner after use by each child, wipe off the seat with a paper towel and dispose of the towel in a covered trash can. Maintain clean and sanitary rooms and equipment and straighten the rooms after the children leave. Not release your child to anyone other than parent or previously identified family member. Preschool departments will be used to provide for children, birth through 3 years of age, during regularly scheduled activities of the church. The nursery will be used for church functions only. Parents must be attending a church function in order to leave their child in the nursery. The nursery will be open fifteen minutes prior to activities at the church. Parents are requested to call for their child as soon as possible after the scheduled event. Parents are encouraged to bring an extra change of clothing for the children. It is suggested that preschoolers be dressed in comfortable, loose-fitting, machine washable clothing that will not restrict free movement. Infant formula, milk or water must be provided in plastic bottles. To avoid mistakes, formula and juice should be already prepared by the parent or pre- measured containers with water made available. Older toddlers will be served a snack or goldfish or animal cookies and/or water or apple juice. Parents are asked to notify the director in the room if the child has any allergies or peculiarities of feeding. Bottles will be fed to infants according to parents’ instructions. Solid foods (such as cereal or baby food) for infants should be fed by parents prior to coming to the nursery/preschool areas if at all possible. Parents attending luncheons and banquets may provide a sack lunch for their child or feed them before being brought to the church. You have a nursery age child and are a regular attendee at First United Methodist, you may be asked to work in the “Parent Rotation Program”. 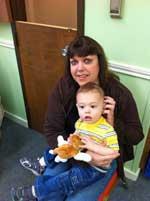 This program stresses parent involvement with the children. This experience will help you develop skills in sharing spiritual values with children which will carry over to family/home relationships. If your child shares in the use of the nursery facilities, we urge you to also share in the responsibility of adequate and quality nursery care by taking your turn in this program. You will be asked to serve either in the early or late morning extended time. Sometimes during his/her early years, there may be difficult periods of adjustment for your child. He/she may not want to stay in their department without you. Be patient. Talk about Sunday School and Church and keep remarks positive. Staying away from Sunday School and Church will not help his/her problem. Reassurance, plenty of love and consistent attendance will sometimes take care of the problem. Avoid rushing the child on Sunday mornings. At the department door, do not attempt to slip away from your child; little eyes and minds are quick. Tell him/her in a kind, firm voice that you are going, but will be back soon. Then leave immediately. If your child continues to be upset, the teacher will page you. It will not be necessary for you to “check” on him/her between Sunday School and the worship service. Attempts to pick up your child quickly after the service or meeting so that he/she does not wait long after all the others have gone, will help him to avoid the “left” feeling. Above all, love him/her in their unconfident times. To avoid congestion in the halls, it is requested that only one parent bring a child to the room and that only one parent call for the child at the close of the service. Parents and relatives are encouraged to avoid coming to the door to check on their child during the session. Parents will be notified immediately if a child seems unduly upset and unable to adjust to the classroom routine. Parents with questions are always welcome to talk with the nursery director after the session. Infants stay in the Nursery until they turn 3 by promotion time (time coincides with the beginning of school--usually the 3rd or 4th Sunday in August). At this time, they will be promoted to the 3 and 4 year old Sunday School Departments and must attend church with their parents. Applicants will be interviewed and screened appropriately. An application form, Salary Form, W-4 information sheet and an I9 form will be completed. A photocopy of the applicant’s driver’s license and social security card will be taken. Experience with children is necessary. Personal references are contacted and a background check is mandatory. Attendance and completion of a CPR course (provided by the nursery) is mandatory for all caregivers. All caregivers are responsible for reading and signing the State Guidelines and the NWHUMC Nursery Policies. Each caregiver hired will be on a 30 day probation period. If within those first 30 days, the nursery coordinator does not see that the placement is successful, then the caregiver employment will be terminated. we serve and please Him, too.